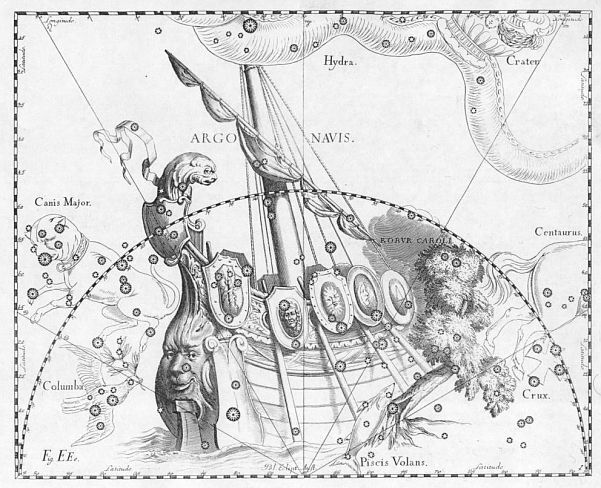 That’s a picture of the constellation Argo Navis. Properly speaking, you should see the lines connecting the major stars to form the framework of the image of the ship Argo, but let’s just say they’re hidden underneath the final image, OK? Just like the framework of your story is hidden in the results. I faced this problem of how to construct a story after I finished writing “The Troubles of the Farnsworths,” as I mentioned in my last post. I had promised people a sequel, and had no idea of what was going to be in it. So I started assembling my constellation, and immediately ran into trouble. The new story was going to have to be connected to Israel Farnsworth. Yet it couldn’t be about him. Israel was one of those mysterious characters, and telling too many stories about him would strip away that mystery. One of the advantages of using a protagonist who is just learning her trade is that it allows the author to engage in exposition and to work out the details of his/her universe while having the protagonist learn them. So I decided to write a story about the new Rebecca when she was young, when she was first starting out as a magician. I had brought in perfectionists to “Troubles,” so this time I thought I would bring in a different religious group, the Shakers. Rather than pin myself to a historical Shaker village, I decided to use Vardley, the fictional Shaker village invented by William Dean Howells in The Undiscovered Country (1880). That way, I could even borrow some of his characters. My plodder took control again. I decided Rebecca would need some advice from a more experienced magician. It couldn’t be Israel, who for some reason couldn’t get involved, else it would be a story about him and not Rebecca. So I pulled Campbell Fitzhugh, my fictional magician in the Sillyverse working for the Secret Service in the 1870s, into the story to advise Rebecca. Soon I ran into a problem. I could not make a go of the Shaker story. Eventually, I let it go. However, even though I abandoned the story, I retained several of its elements: Rebecca’s gray hair and walking stick, the Leigh sisters, and the connection to the Sillyverse. They were still points that I had connected into a framework I could still use, notwithstanding the loss of the Shaker element. There’s a lesson there: be flexible in constructing your constellations of ideas, and don’t discard everything just because you get rid of some things. Remember the Argo Navis? You won’t find it on any modern star map. Why? Modern astronomers thought it was too big, and broke it up into several smaller constellations. Although, just as I retained story elements from the discarded Shaker setting, so too did astronomers retain the Greek letter designations for the stars from the original Argo Navis constellation, even after they broke it up. Having discarded the Shaker story, I had a few false starts. Finally, I went back to take a look at the original story. Never hurts to make another connection. Although it was not specified, I had intended the original story to be set in the Berkshires. Well, it still could be set there, and so could the sequel I was trying to write. And what else were the Berkshires famous for? Rich people building “cottages” at the end of the 19th century. I even had a guidebook for the Berkshires from 1887, talking about who visited there in 1886. So I had a place and a date. Campbell Fitzhugh would no longer be available, as he left the Secret Service in 1880, but Abigail Lane would be available, and she was a much better match for Rebecca. This put me into a chronological fix, however. While “Troubles” had no definite date, it had to be set between 1816 and 1860 for some of its references to make sense. If the new story was to be set in 1886, Rebecca could hardly be a young woman just starting out in magic; she couldn’t be under 26. So instead of Rebecca just starting out as a magician, I decided that she would be resuming the practice of magic after several years. To explain that, I invented her marriage, as explained in chapter 10. And with that Rebecca’s birth date was fixed in 1855. She would be 31 years old in Dragon Lady, married and a mother of four. By this point, I had the basic story together. Rebecca was an out-of-practice magician who would have to resume using magic. She would need help, and get it from Abigail Lane. The story would somehow take her back to her home town and family, which would allow me to make all sorts of additional connections. She would have the youngest Leigh sister as an assistant. And the story would end with a confrontation between Rebecca and her enemy, a confrontation I figured Rebecca would not survive, but Abigail would. With that, The Dragon Lady of Stockbridge came into existence. There was one last set of connections I made, just before I started writing the story. I wanted to make Rebecca Farnsworth Maxwell distinctive. Well, she had a walking stick. Magicians use wands. Why not make her walking stick her instrument of magical power? But that raised the question of where she got it. The natural answer was from Israel. But why would Israel turn over a powerful magical artifact to his young “niece” (actually cousin)? He wouldn’t, not without careful preparation. But suppose Rebecca, who could be quite willful, decided to try something she didn’t quite know how to do properly? There was a craze for Japanese culture in the early 1870s, so perhaps Israel acquired a Japanese walking stick charged with magic. Rebecca, as a beginner, would not know how to handle it properly, and end up doing something different than what she intended. Indeed . . . it cost her. I’d been wondering how to explain her gray hair, and now I had it: it was the fee the dragon took when they were bound together. This entry was posted in Dragon Lady, Writing fiction and tagged creativity, Fiction, inspiration, Magic, Writing. Bookmark the permalink. I really do wish I had the telepathic powers of my characters, for then I could just sit here and nod and smile and you would feel waves of “agreements”, instead I must find the words to express “yes, yes, yes, hit nail on head”. It is that constellation that makes it work, In my previous comment to your previous post I said of being a plotter, but only within a framework, and that’s what you have here described, Good post, So what’s in part 3, apart from Chekov’s gun?